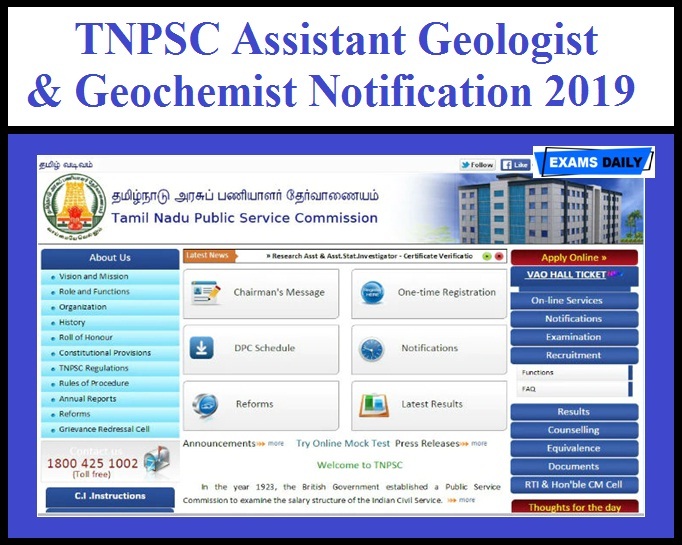 Tamil Nadu Public Service Commission (TNPSC) has released Notification for the Post of Assistant Geologist in Department of Geology and Mining (Code No.1863) & Assistant Geochemist in Public Works Department (Code No.1752). TNPSC has 15 Vacancies. Applications are invited from eligible Candidates. Candidates can apply through Online from 12.02.2019 to 11.03.2019. Education Qualification: Candidate should have completed M.Sc Degree/ Applied Geology / Science (Technology) in Hydro geology with Geochemistry/Chemistry as one of the subjects in degree level or in the Post Graduate level of any University. Selection Process: Selection will be based on (i) Written Examination and (ii) Oral Test in the form of an Interview. How to Apply: Candidates who have made One – Time Registration must apply for these notified posts. Candidates can apply through TNPSC official website www.tnpscexams.in from 12.02.2019 to 11.03.2019.